Welcome to the official Cole Cycle Sales website. We are located near historic downtown Angola, Indiana and have served the community for five decades. We sell new units from brands such as Kymco, Tao Tao, and Hisun. We are a full-service motorcycle and scooter repair shop. We will service almost all makes and model of scooters and ATVs, new or old. We sell and install the Dunlop brand of tires as well as many other brands of tires. We are now hiring for a motorcycle mechanic position at our shop. 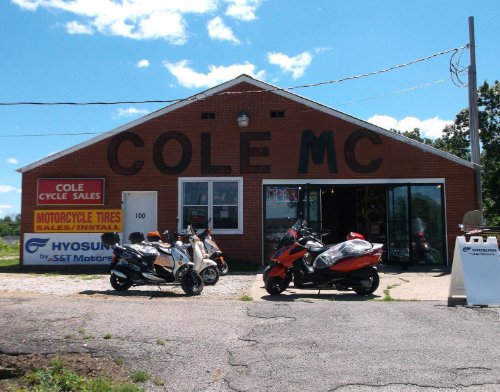 Go to the "Events Currently Going on at Cole Cycle Sales and Kymco" page of this website for more details. Kymco Sport ATVs: Click here to view the models. Tax time is the best time for important repair services! Corner of Gerald Lett and West Highway 20 at the stoplight.